Contemporary Tasmanian Aboriginal baskets by Vicki maikutena Matson-Green, Patsy Cameron (also second from right), Dulcie Greeno and Audrey Frost. Photo: Simon Cuthbert, Tasmanian Museum and Art Gallery. Tayenebe, a Tasmanian Aboriginal word meaning 'exchange', celebrates the revitalisation of tasmanian Aboriginal weaving that has been taking place over the past three years. 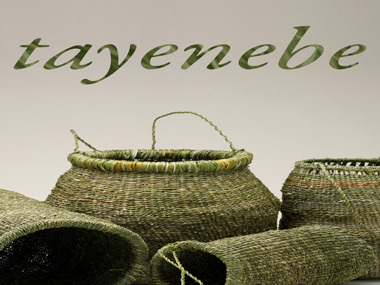 The tayenebe exhibition includes beautiful baskets and kelp water carriers in contemporary and traditional styles, along with a historical basket made around 1845 which has never before been seen outside Tasmania.